Robotics in Kosovo is a very new subject, and it is an unexplored territory for us, knowing that fact we decided to challenge ourselves and take part in a Robotics Challenge of Global scale, to tell to the world that we too can achieve a working robot, and we did it! We build our robot, and during the process we also learned a lot, not just technical aspects of building a robot but also the importance of working in team and communicating with each other, brainstorming to overcome the technical difficulties and challenges during this journey, and also we have been in touch with other teams from around the world, we created friendship even thou in that time we never met them, and eventually we met them during the challenge, some of them were our allies and some our opponents, but as in all sports and challenges when our opponents won we did not grieve instead we cheered with them too, at the end it was just a game right, but our friendship still lasts even after the games this is the most important thing. The whole process of this robotics challenge was really great experience for us, we came together twice a week to build our robot every time with greater enthusiasm for bringing new ideas and put those ideas to test, some worked out some did not but at the end we had a really sophisticated robot in our hands. 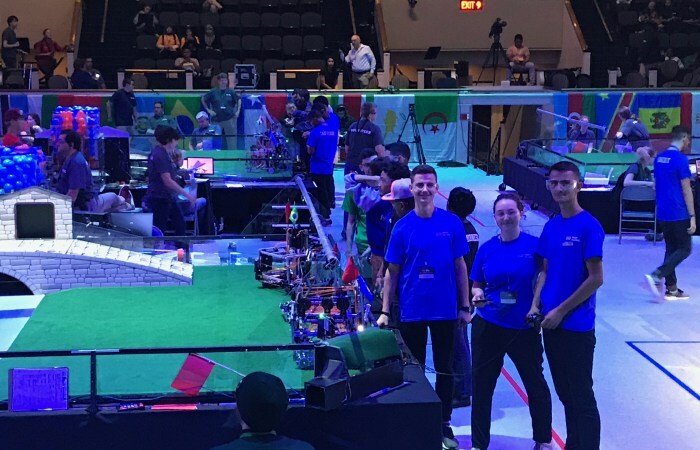 The FIRST Global Challenge is a truly international robotics event where students from nearly 160 nations across the world took part and we had the chance to meet most of them. At the beginning of the match, 40 water (represented by blue balls) and 10 contaminant (represented by orange balls) particles flow into the river. After this initial flood, balls continue to flow at a steady rate. Two alliances of three robot teams each represent the two villages. Each alliance receives points for putting contaminants in their respective laboratory and water in their respective water reserve. During our adventure in FIRST Global we compete in randomly assigned three-team alliances during each round of play. In every individual game will had two alliances facing each other at a time, for a total of six teams on the field. We compete with other teams on a field (inside Constitution Hall at Washington DC, 16-18 July 2017) that is approximately 6 meters long by 4 meters wide. We want to thank UBT and IPKO Foundation for their contribution they gave to help us to make this happen and represent Kosovo in a really great global event, where the flag of Kosovo waved besides more than 100 nations worldwide and for Inspiring science and technology leadership and innovation in young people in order to increase understanding, impress the importance of cooperation, address the world’s most pressing issues.